Aim: To compare facial features related to the nose, lips and face between the Caucasian, Asian, and Black ethnicity in the Brazilian population by means of linear measurements and proportion indices obtained from the analysis of three-dimensional (3D) images taken by 3D stereophotogrammetry. 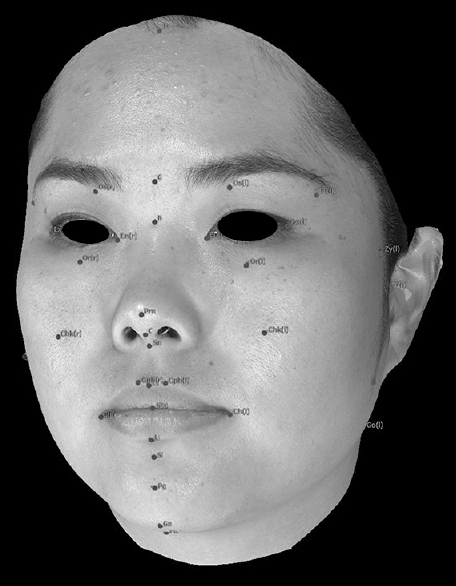 Materials and Methods: Thirty healthy subjects, being 10 Caucasians, 10 Blacks and 10 Asians had reference points (landmarks) demarcated on their faces, 3D images were obtained (Vectra M3) and the following measurements were calculated: Facial proportion indices relative to the nose, lips and face. The statistical analysis was performed comparing the ethnic groups (one-way analysis of variance). Results: The Blacks and Asians showed the greatest difference in the face analysis (width, height of the lower face, upper face index and lower face index – P < 0.05). In the comparisons between groups, differences were verified to the mouth width and lower lip vermilion height. In the nose analysis, the biggest differences were obtained for the proportion indices, being that Caucasians versus Asians and Caucasians versus Blacks have showed the largest differences. Conclusion: This study found the presence of some similarities in the proportion indices of nose, lips and face between the ethnic groups of the Brazilian population, as well as some important differences that should be known to guide surgical and forensics procedures, among others. Aim: To assess the data regarding dental prosthetic status and prosthetic needs of institutionalized elderly living in geriatric homes of Mangalore, Karnataka, India. Materials and Methods: A cross-sectional survey was conducted among institutionalized elderly living in geriatric homes in Mangalore. The sample size was estimated to be 300. The information related to sociodemographic data, prosthetic status, and prosthetic need was obtained using the WHO Oral Health Assessment Form 1997. Chi-square test was used to analyze the data. Results: Out of 300 elderly people, 94 were males and 206 were females. The study results showed that 53.1% and 60.45% of the total subjects had no prostheses in upper and lower arch, respectively. The study also revealed that the need for full prostheses was more among females compared to males. Conclusion: The present study concludes that need for prosthesis was high among the institutionalized elderly. Aim: To evaluate salivary calcium levels in healthy subjects and patients with chronic gingivitis and Chronic Periodontitis. Materials and Methods: One fifty subjects in the age range between 20 – 45 years were randomly selected and subjected to periodontal examination using gingival index, plaque index, oral Hygiene Index and clinical attachment loss. Following periodontal examination, subjects were divided in three groups of 50 patients each: Group A: healthy subjects, Group B: gingivitis patients, Group C: periodontitis patients. Saliva samples from the study subjects was collected and subjected to estimation of salivary calcium levels. The obtained results were subjected to statistical analysis. The significance of difference in means was tested by ANOVA test. Results: The levels of salivary calcium increased as the disease progressed from healthy to gingivitis and periodontitis. 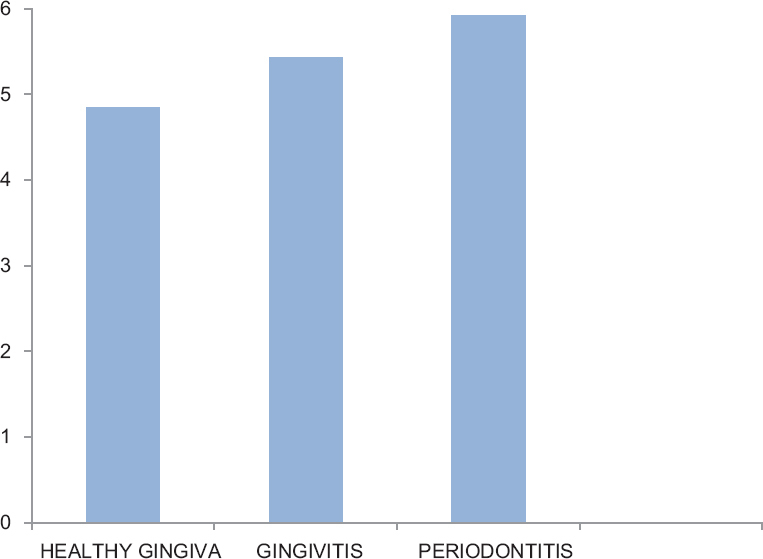 There was statistically significant difference observed between healthy to gingivitis group and gingivitis to periodontitis group. Conclusion: Salivary calcium levels can be used as a biomarker to assess the periodontal disease progression. Early diagnosis of periodontal disease by estimation of calcium levels in saliva can help in prevention of gingivitis or periodontitis by various therapeutic measures. Aim: The distribution and severity of oral diseases are significantly influenced by oral hygiene practices. 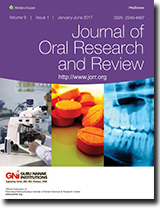 The aim of this study was to assess the oral health practices among secondary school students in Lagos State, Nigeria and investigate the influence of oral hygiene practices on caries experience. Materials and Methods: Questionnaires were administered and dental examinations conducted on 598 schoolchildren aged 11–20 years. The students were recruited from two Local Government Areas of Lagos State. Statistical significance was determined at P < 0.05 using Chi-square tests. Results: Majority of the participants (57.6%) had never visited the dentist. “Lack of pain” (31.1%) and “no reason” (42.5%) were recorded as the reason for not visiting the dentist. While toothbrush alone was used as a cleaning item by 73.9% of the students, 70.4% used fluoride-containing toothpaste, and 76.9% brush their teeth twice daily. The prevalence of dental caries was 9.7%. Caries prevalence was significantly associated with the use of fluoride-containing toothpaste (P = 0.015) and frequency of cleaning (P = 0.04). Respondents who used fluoride-containing toothpaste were about 2 times less likely to develop dental caries (odd ratio [OR] = 0.425 95% confidence interval [CI]: 0.45–1.32) and those who brush twice or more daily were 2.4 times less likely to develop caries (OR = 0.44 95% CI: 0.20–0.94). Conclusion: The oral health practices of the participants were not satisfactory. Although the prevalence of dental caries was low, it was significantly influenced by frequency of toothbrushing and the use of toothpaste containing fluoride. Aim: This study aims to compare the nicotine concentration and pH in commercially available smokeless tobacco (ST) products. Materials and Methods: The pH level and nicotine concentration were determined in five ST products which were obtained from local markets. The pure form of nicotine was used as a standard which was obtained from Sigma-Aldrich Chemicals, Bengaluru. An extract of each product was prepared and the nicotine concentration was determined in triplicates by spectrophotometric method. The estimation of pH was done using digital pH meter. Results: The analysis showed that nicotine concentration was highest in plain tobacco followed by ghutka, khaini, pan masala, and supari, respectively. 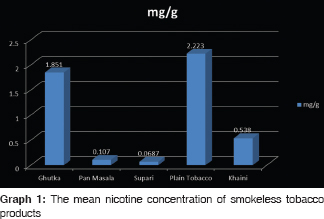 The pH was highest in khaini followed by pan masala, supari, ghutka, and plain tobacco, respectively. Conclusion: The study results showed that there is a difference in nicotine concentration and pH among ST products. Although other factors could influence the rate of nicotine absorption from ST, manipulating tobacco pH appears to be the primary means by which the speed of nicotine absorption is determined in ST products. Aim: Recurrent aphthous stomatitis (RAS) is characterized by recurrent painful, single, multiple ulcers appearing in oral mucosa. Various studies have been conducted to find the prevalence of RAS worldwide. Till now, no studies have been conducted to report the prevalence of RAS in Maharashtra. The aim of the present study was to evaluate the prevalence of RAS in western population of Maharashtra. Materials and Methods: A total of 71,851 patients within the age group between 10 and 70 years were screened for a period of 5 years from March 2011 to March 2016 in western population of Maharashtra. Collected data were recorded and entered, verified, processed, and analyzed using software package SPSS program version 19. The frequency and distribution of RAS in gender, age, and site were calculated. Results: Out of 71,851 patients, only 72 patients were clinically diagnosed to be suffering from RAS. The prevalence of RAS was 0.1%. There was a higher prevalence in females as compared to males and it was most common in the second and third decades of life, with buccal mucosa as the predominant site followed by labial mucosa and tongue. Conclusion: Based on the results of our study, the prevalence of RAS in western population of Maharashtra was 0.1%, which was very low as compared to other Indian population. Females were more commonly affected. The most common age affected in our study group was second and third decades. The most common site was buccal mucosa followed by labial mucosa and tongue. Fusion is a developmental anomaly which occurs due to a union of one or more adjacent teeth during morphodifferentiation of the dental germs. The prevalence of tooth fusion is estimated at 0.5%–2.5% in the primary dentition. These anomalies may be unilateral or bilateral and may affect either dentition although the deciduous teeth are more commonly affected. Early diagnosis of such condition is important because it may cause clinical problems, such as esthetic concerns, and caries. 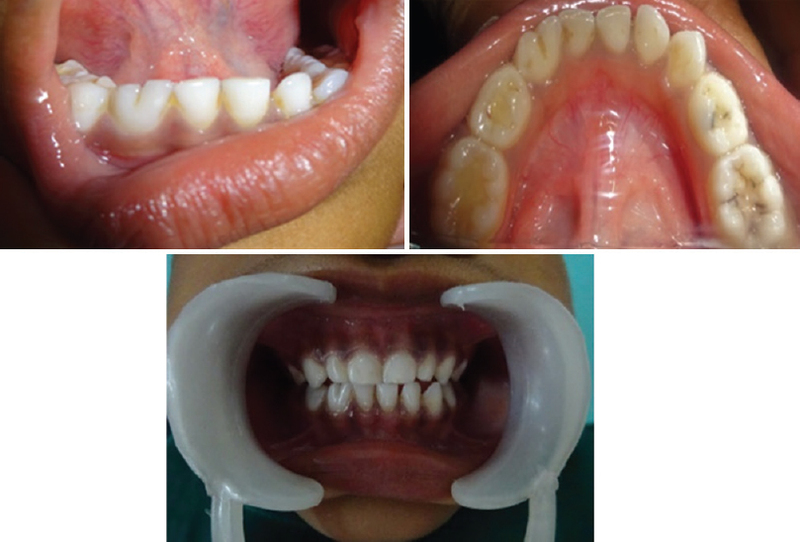 This report describes a case of unilateral fusion of the primary mandibular lateral incisor and canine and aims to evaluate any associated pathology. Periodontitis results from the loss of a delicate balance between microbial virulence factors and a proportionate host response. 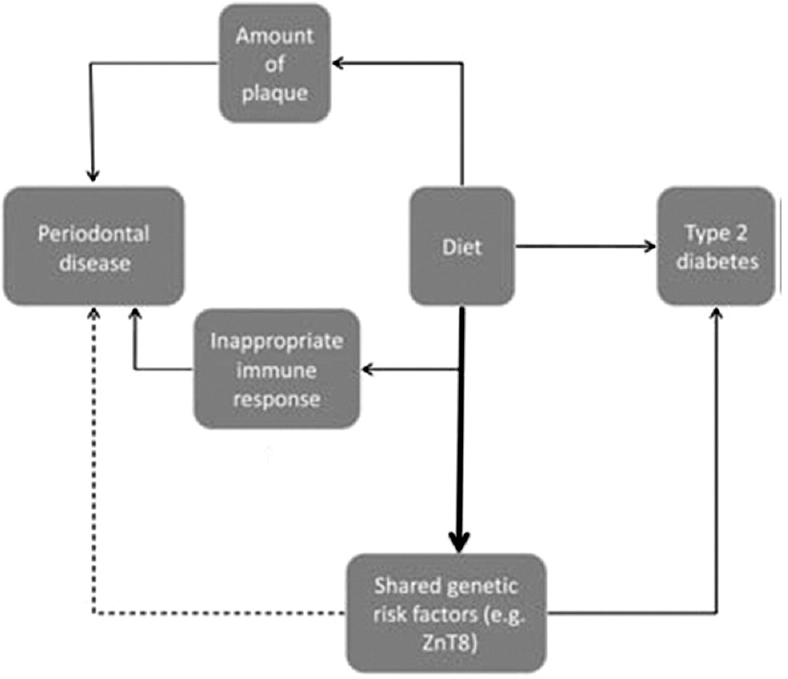 Nutrition may be important in redressing the balance between microbial challenge and the host response because it has been implicated in a number of inflammatory diseases and conditions, including type II diabetes mellitus, cardiovascular diseases, rheumatoid arthritis, and inflammatory bowel disease, all of which have also been associated with periodontal diseases. Nutrigenomics is concerned with the impact of dietary components on the genome, proteome (the sum total of all proteins), and metabolites (the sum of all metabolites). This article reviews the evidence for nutritional impact on periodontitis. With the advent of rotary nickel titanium (NiTi) instruments, preparation of curved canals have become easy but chances of instrument separation have increased. 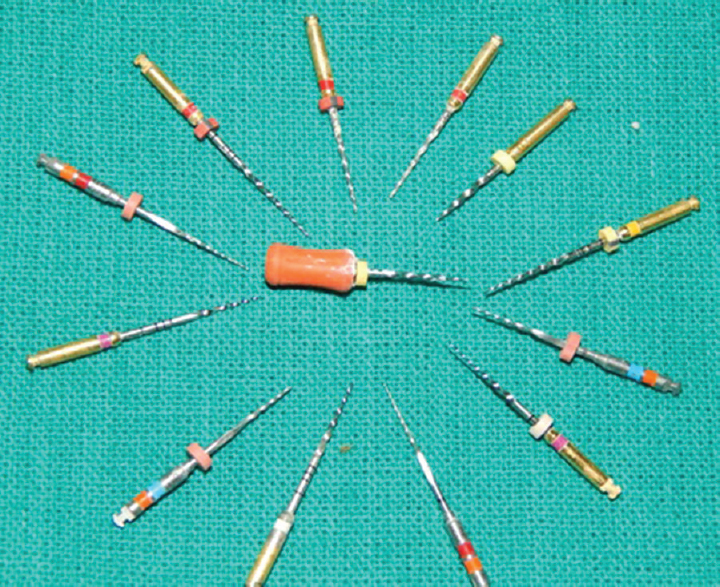 Such an instrument separation can cause procedural problems in rendering endodontic therapy. There are various factors that cause separation of rotary NiTi instruments. These factors, various failure mechanisms and impact on the prognosis of instrument separation have to be well understood by the clinician. Neopterin is a catabolic product of guanosine triphosphate, a purine nucleotide and belongs to the group pteridines. When the cytokine interferon gamma stimulates the human macrophages, they synthesize the neopterin. It is an indicative of a pro-inflammatory immune status and hence serves as a cellular immune system marker. In most of the diseases, in which the cellular immune system is involved, we find that the neopterin concentrations are usually high. In the periodontal diseases, the levels of neopterin usually fluctuate which is proved by its increase in disease progression and a decrease after treatment. Periodontal diseases are characterized by enhanced macrophage infiltration to the periodontal lesion, so neopterin being a macrophage activation marker may be seen in higher levels. This review deals with neopterin and its mechanism and its use as a marker in the diagnosis of the periodontal diseases.